James McGregor Burns, considered by many to be the father of modern leadership practices, once famously stated that "Leadership is the most observed, yet least understood, phenomena on earth." A generation later, we find this still rings true today. Our work at the Illinois Leadership® Center is to study and teach the skills for effective leadership relevant to the 21st Century. 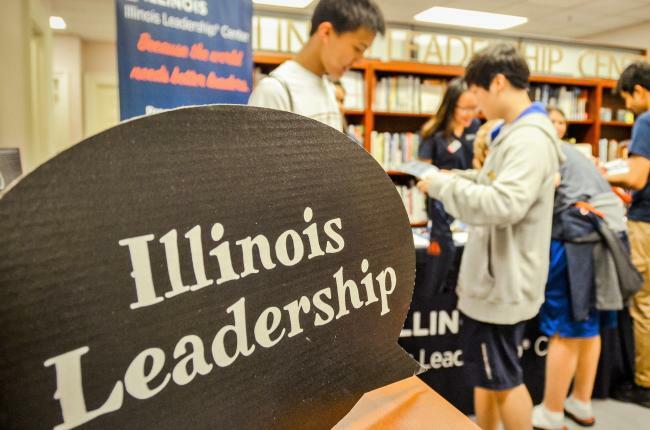 The Illinois Leadership® Center (ILC) opened its doors in September 2002, as a partnership between Academic Affairs and Student Affairs to provide comprehensive leadership education to all students at Illinois. In addition, we believe that leadership can be taught. While some may have more inherent skill at the practice of leadership than others, we believe everyone can enhance and refine their abilities to lead others. We have created a set of Core Competencies that we believe all effective leaders should possess. All of our programs and initiatives are designed to help students learn and develop in these areas. The Illinois Leadership® Center at the University of Illinois seeks to be an internationally acclaimed provider of leadership education, research, and experiential opportunities for students. The Illinois Leadership® Center is committed to developing and enhancing the leadership skills of all students through assessment, learning, and experiential opportunities. In addition, the Center supports faculty and staff who are pursuing leadership-related teaching, research, and student engagement activities. Student Learning - We believe life-long learning and personal growth are essential to effective leadership. We provide purposeful programs and services that allow students to engage in self-discovery, learn essential skills, and apply them to their daily life. Diversity & Inclusion - We strive to create safe inclusive environments that are accessible and welcoming to all students. Our programs are designed to engage students about and across difference, promote respectful dialogue, and create change for a greater good. Collaboration - We strive to develop collaborative relationships with students, faculty/staff, and alumni to create effective learning environments and achieve common goals. Integrity - We are committed to practicing and teaching ethical leadership by aligning our values and actions, modeling professionalism, and being a good steward of resources. Innovation & Continuous Improvement - We strive to provide innovative programs and services that are informed by assessment, current theories, and research.